Highlights from the Saturday evening banquet of the 2019 NAFM Convention was naming of honoree's. 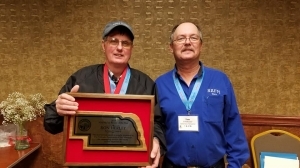 Ron Herley, of Seward County was named "Fair Person of the Year". Vice President, Tom Shellpeper, presented Ron with a plaque and his family joined him on stage. 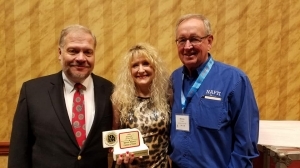 Roger Olson, NAFM Board member, named Wynne Adams as "Associate of the Year". Wynne is a talent agent in Nashville, and serves as the emcee for the Showcase at convention.